Being a mom of 4 boys I am always in need of good gift ideas for boys. Boys are hard for me because I don’t know what they want. Girls are easy because I can just get them clothes, shoes or craft supplies and they are happy (at least my girl is). My two older boys are getting to the age that they aren’t super interested in toys but at the same time I don’t want to just get them electronics. I want to give them a variety of things for Christmas. So here is my pick for pre teen boys. These 12 items are either things that I plan on getting my boys or things that they already have and love. Oh and I have teamed up with 9 other bloggers to give you a $100 gift card GIVEAWAY, so make sure you go and enter that too! •Capture Card– This is the main gift for my 11 year old. What does it do- it makes a video of a game that you are playing on your computer or gaming device. My son is really into this and he loves to upload him playing onto YouTube and I’m personally getting sick of him stealing my phone and using up all my storage. •The 39 Clues Books– My 9 year old LOVES this series and asked for these books for Christmas. There are several series within the 39 Clues books, some are about detectives, some are about agents and codes and other are about disasters. They are fun books for them though and I always like to give my kids books. •Dominion Game– This is a card game that is super fun for boys to play (girls too). We actually have this game and the kids really like to play it. You make villages with cards, the cards have actions and you try to get the victory points to win. •Settlers of Catan– This is a great family game (we actually have the expansion pack so you can play up to 6 people). This is another building game, but you build villages and cities with resources and try to get to 10 points. Like I said, it’s a really fun family game (we played it over Thanksgiving weekend and had a blast). •Electric Scooter– These are just so much fun and a great way to get your kid outdoors and doing something (besides playing video games). •Game Band– This is a cool thing, it’s a USB band that you can save your Minecraft worlds onto and then you can play them on any computer. It’s nice for when they go over to a friend’s house and want to play their world on someone else’s computer. •Silicone Lego Mat– My kids don’t play with many toys but they still play with Legos. They love to make Lego videos and this mat is so cool. The fact that it’s silicone is nice because it makes it really use to get some of those little pieces off. •Minecraft Handbook– These are just really fun books, we have all the handbook books and the kids enjoy reading them. •Minecraft Game– Clearly we like Minecraft, I have a page of just Minecraft ideas. I don’t love my kids playing video games all the time but Minecraft is different for me. It’s like building with Legos but instead on the computer. Just this week my 4 kids spent time building our house on Minecraft and I was so impressed by how much it looked like our house, it’s just fun to see them create! •Kindle Fire– Amazon just lowered the price of their Kindles to $50 this year and they have made it even better, with cameras. You can’t beat a tablet for $50 and they are the perfect size. We have a few of the older generations and my kids have LOVED them. 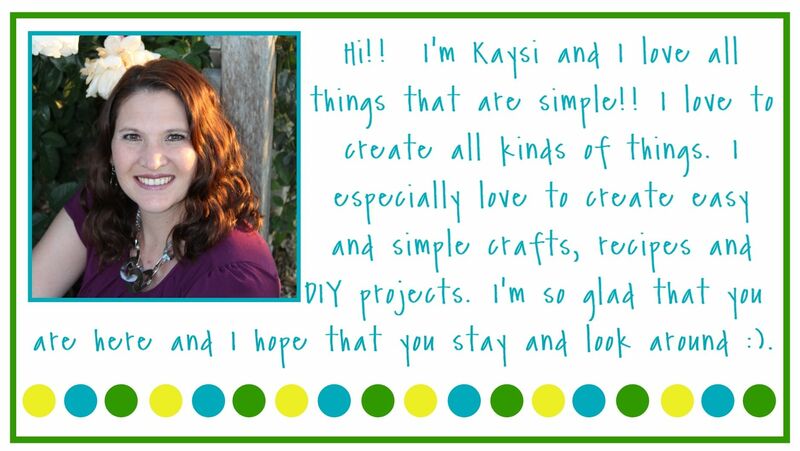 They are a great price and perfect for when we take car rides or reading their books. •Head Phones– There isn’t much explanation here, they are fun to have. •Minecraft Shirt– This shirt is so much fun, I love clever shirts like these. Plus being a chemistry major in college, I’m thinking that at least one of my boys needs to have this shirt! 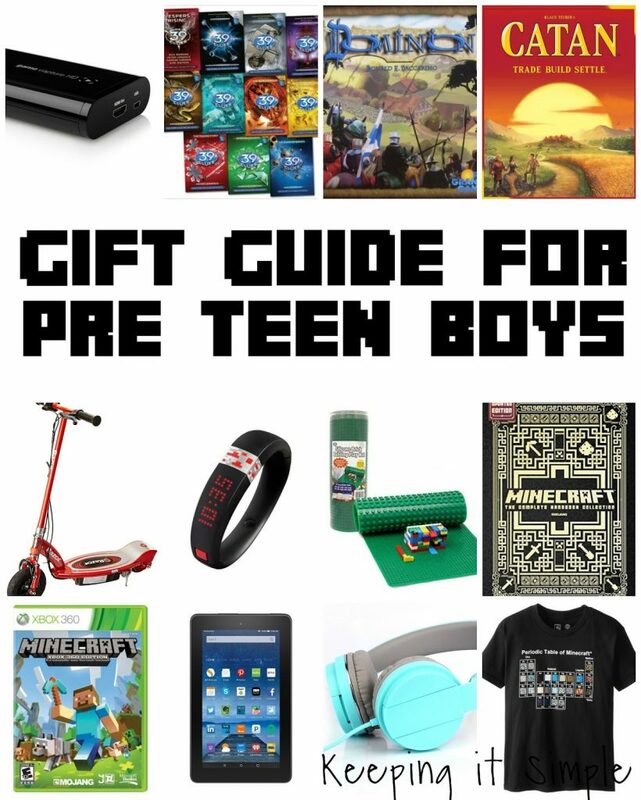 So there is 12 ideas on what to get your pre teen boy. I hope that some of suggestions helped. And now for the fun giveaway!!! 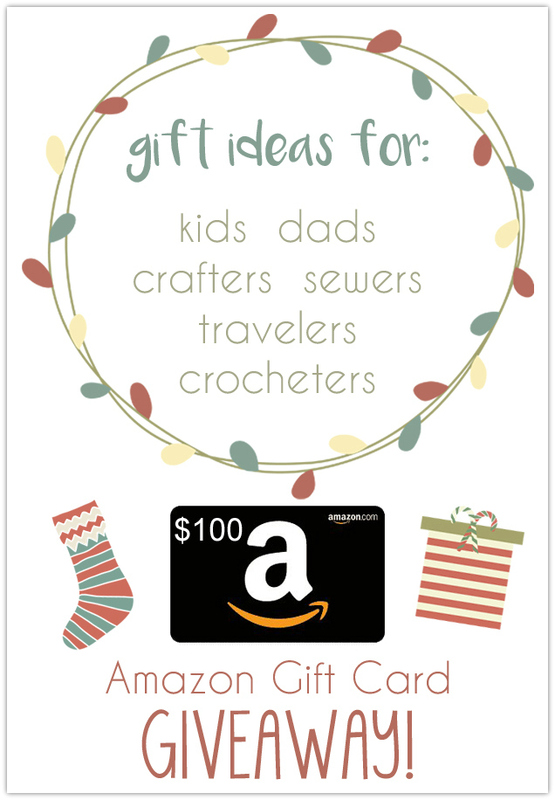 Who would like a $100 Amazon gift card?? I know that I could definitely use it this Christmas season. Just enter the giveaway below. Thanks for this gift guide. I think there are actually some pretty great ideas for my husband on here! Hahaha! He's such a big kid!